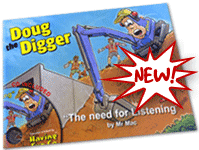 Doug the Digger comes to life in these educational children's books - "The Need For Listening" and also "The Need for Good Teeth." 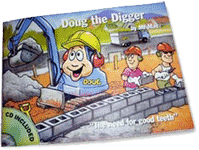 Each has lots of full colour pages which teach all aspects of safety and work practices with interesting dialogue that is easy to read and fun for children of all ages. Included with each book is a CD that has full narration of the story and sound effects to match and are a great tool for those learning to read. Various pages from the books are now available as puzzles for even more fun. Books are $25 each. Mr. Mac and Doug will even sign your book with birthday or other messages if you like. NEW! "The Need for Good Teeth" has been printed in a larger A3 size - perfect for story time on the mat. Puzzles are available in 35 (large) piece and 60 (small) piece versions and are $10 each. P&P within NZ is only $4 for up to three items per envelope. 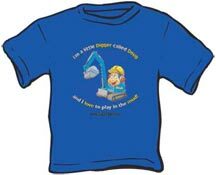 Kids sizes 4 - 14.